The stunningly attractive deep coppery-brown young leaves are a perfect foil for the very pretty, large single bluish-white flowers in April. 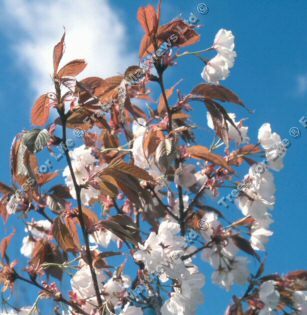 Chocolate Ice (Prunus - Matsumae-fuki') is an unforgetable sight wehn viewed against a clear blue sky. Its habit is upright in the early years spreading as it ages. A Matsumae cherry. A small, so expect a height of up to 4 metres (13 foot) after 10 years. Chocolate Ice is supplied at a height of between 1.5 and 2.0 metres in a 5-12 litre container for year round planting and better results than from either bare-root or rootballed stock. A small sized tree, so expect a height of up to 4 metres (13 foot) after 10 years.